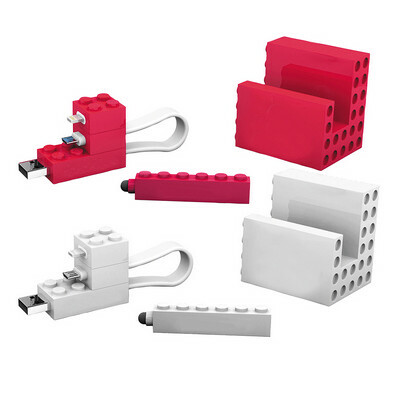 Description: Office blocks 3 piece stationary set. Phone stand, stylus & mobile cable set with micro USB and lightening connectors. Available in 2 colours. Features: Packaging: Individually packed in a polybag and presented in a white tuck box. Packaging size: 83mm(h) x 125mm(w) x 50mm(d). Colour: Red Material: ABS Plastic Product Size: Stand: 60mm(w) x 60mm(h) x 50mm(d) Freight details : 100 per carton, 9.5kgs, 43 x 54 x 28cms; Decoration Type(s): Colour Print / Full Colour Print Decoration Area: 45mm(w) x 30mm(h) On front of phone stand. Price includes : 1 Colour 1 Position Print. Setup is included.